Comparing this list to last year, the first thing one notices is the new entry on rank 3: OSMC generates a steady amount of traffic, with visible peaks whenever they do a release. They were not in the 2015 top ten because we only started mirroring it in Q4 of 2015. Linux mint dropped from rank 3 last year to rank 5 this year, with much less traffic than last year. And that is despite a slightly different counting that should actually have increased their numbers: We are now summing up the two parts of the mirror, the ISOs and the packages. Not because we want to do that, but for technical reasons – we cannot always distinguish between the two in the stats, and not summing them up would make the stats even more wrong. Now judging from the stats, we must have been dropped from their mirror list for ISO downloads around June of 2016. From there to the end of the year, almost no requests for the Mint ISOs have hit our server. As to why we were dropped, we haven’t got the slightest clue – we got no notification about the removal. We did get a notice about being readded at the beginning of 2017 though. Last years rank 10, videolan, dropped off the list – it would be on rank 13 this year. Rank 1 and 2, Qt and kiwix, are really close head to head. For all other mirrors, they swapped positions here and there, and all of them generated a little more traffic than the year before, but there were no big changes. With the exception of Linux Mint, where I’ve already explained the reason above, all mirrors had more IPv6 traffic, sometimes significantly more. This is also visible in the total IPv6 traffic over all mirros: 13.68% of all traffic in 2016 was IPv6, up from 10.54% in 2015. There are still huge differences in the IPv6 traffic share between the different projects mirrored, and most of the time it isn’t really clear why. One example where it is clear though is cygwin, with an IPv6 share of pretty much 0%: They use a setup-tool that downloads individual packages from the mirrors, and it seems this tool only does IPv4. People operate mirrors out of different reasons, this could be purely altruistic to support open source communities, or to reduce incoming traffic by providing local clients with an internal package source, or to tilt the in/out ratio of the internet uplink. What ever the reasons are, they are all associated with the usage of outbound traffic and local storage size, in addition to occupation of other hardware and administrative resources. We will consider traffic and storage requirements as the costs and outgoing traffic as the profit (to the general public or an organization) a mirror service provides. Now looking around at what other mirror operators publish, it is very hard to find useful information to guide the mirror selection. Which means, that if you plan on hosting a new project, you have to rely on guesswork to estimate cost vs profit. Although cost and profit are terms usually associated with currency based units, we will not estimate them using any such metric. We will consider Gigabytes as the unit for storage and traffic and therefore cost and profit. By combining logged data from the ~50 mirrors we are currently hosting, we are in the position to quantify both cost and profit for each one of them. Be aware that the profit often depends on the geographic location, since many projects use a topology- and geography-aware load balancer like mirrorbrain. We calculated this by summing up all positive changes in mirror size, which is calculated and logged on a daily basis. Since we sync up to hourly, files that get synced and deleted within a day are not covered, nor are files that change. How about storage costs? Since most mirrors stay around the same size, with a slight increase taking the average size works for most. But some have a tendency to constantly increase (or even decrease), this won’t be correct in all cases. Kiwix on rank 2 has only been mirrored since March 2015, so it generated that amount of traffic in only 9 and a half months – it might well take over the top spot next year. The Ubuntu release ISOs dropped out of the Top 10 for IPv4. As is to be expected, the CCC conference recordings generate extremely peaky traffic after CCC events – setting a new record high with 11.3 TB in just one day on December 30 (after 32C3). It might even have made a little bit more, but unfortunately the webserver ran out of threads because someone apparently distributed web-torrent-files with 64 KB of chunksize. The list is slightly different for IPv6. IPv6 traffic is up – from 7.86% over all mirrors in 2014 to 10.54% in 2015. Absolute IPv6 traffic is also up in 2015 for all mirrors in the Top 10. The share of IPv6 traffic varies greatly between the mirrors. Still only a small fraction of the traffic is via IPv6, 7.86% over all mirrors and the whole year. CTAN for some reason drops out of the IPv6 list (it would be at #17), its Top10 slot is taken over by Debian (#16 in the total list) which has an unusually large IPv6 share. That large share can be attributed mostly to the local Computer Science Department which has large pools with IPv6 capable Debian machines. 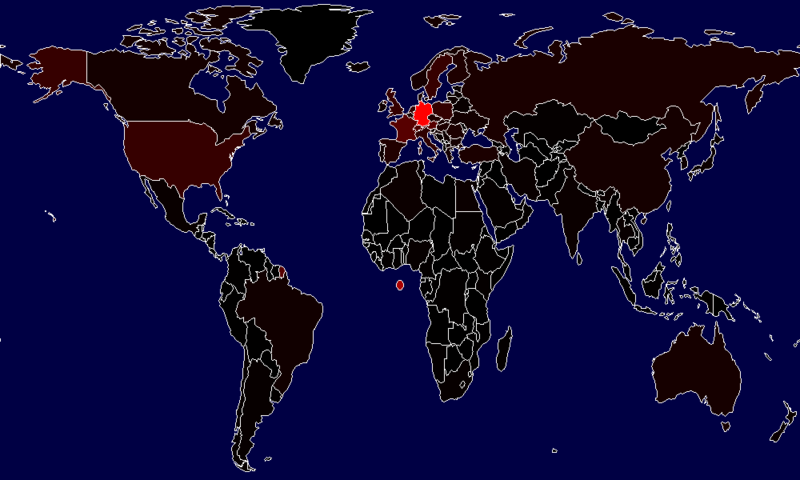 As you can see, unsurprisingly most of our users come from Germany. Besides the map there is also a table that show the respective percentages per country – in the map above, Germany accounts for about 50 percent of all accesses. Note that is counting the number of bytes transferred, not the number of accesses. To do the actual dirty mapping work, we’re using GeoLite data created by MaxMind, available from http://www.maxmind.com. This is a free-to-use version of their commercial GeoIP-database, and since they need to make a living from their database, the free version is of course less accurate than the version available to their paying customers. 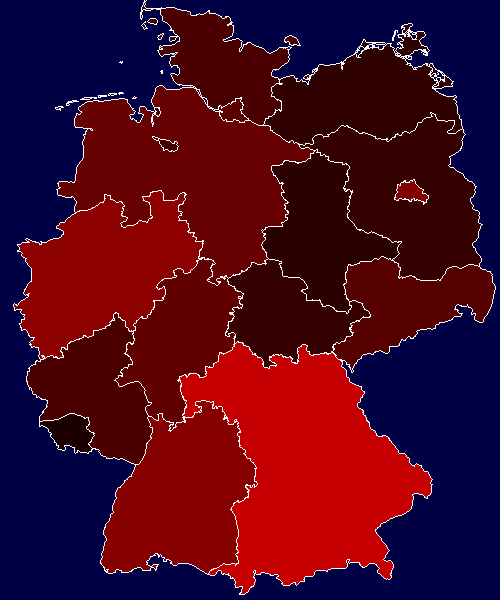 It just returns “unknown” for the Bundesland in roughly about 30% of all cases. Due to technical limitations on our side, we’re currently using a rather dusted version of the geoip-mapping library, that for example still has problems mapping IPv6 addresses (although it works sometimes). The quality of the mappings should improve significantly after we update to their current version in the first half of 2015. Our logs are normally anonymized, i.e. we do not store the full IP address of a client, but trim (at least) the last octet of an IPv4 IP. This further reduces mapping quality. Still, we do think it is a rather interesting experiment. While we were expecting most of our users to be from Germany, we found the actual percentage suprisingly high – we had expected some more usage from other european countries.